Some–okay, most–of the truths I hold most dear now would have struck me as utter nonsense, at some other point in my life. I don’t even remotely think that’s a bad thing. In fact, I really like that about myself. It lets me know, I’m open to new ideas. And I look forward to having more changes of perspective as life calls them to me. Isn’t that what life is all about? Not the flashing-some-knee-or-not sort of modesty here. More a being-open-to-new-perspectives kind of modesty. It’s about growth. It’s about being excited by new ideas instead of resistant and argumentative. 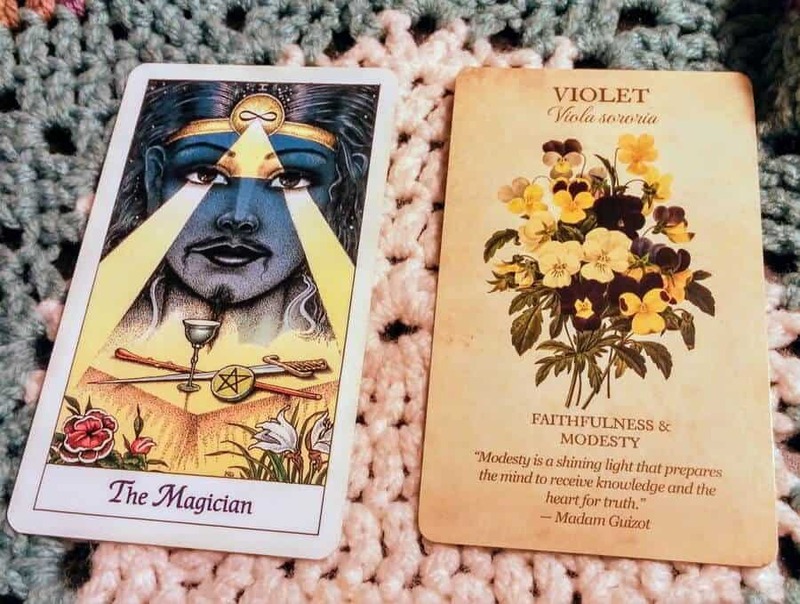 Both the Magician (from the Cosmic Tarot) and the Violet (from Botanical Inspirations), “Faithfulness and Modesty,” feature shining light in some fashion. I like that! And are those violets on the the Magician card as well? Repetitive Tarot is repetitive. Ha! Expect changes in perspective this coming week. Understand how you choose to frame any given situation shapes your ultimate experience of that situation. Shine light on what you prefer, what matters to you, what you appreciate and want to see more of in your world. This sort of concerted focus gives that perspective new life. I mean, you could focus on what’s not working, too. That’s certainly a valid choice. But that’s old news to me–a manifestation, the result of the energy already expressed. Looking at bothersome “reality” is sort of like standing in the midst of a mob, adding to the cacophony of voices about what already is. But looking forward, focusing on what you want to see, is more akin to a front-row seat to the future. That’s the ride I like best. Your magic tool here is your focus. Use it as you will. Understand that feelings will be magnified, so it makes sense to consciously direct thoughts that shape those feelings, which in turn shapes the reality you are creating for yourself. Full moon in Cancer on January 1st, so maybe not so surprising we’re talking about shining light. That’s what full moons do! It’s in the sign of Cancer, so it may be sort of like the world has a case of “the feels.” Be completely sincere or withdraw, since people will be very receptive to vibes and any misdirection or other crapola just isn’t gonna fly. This full moon is opposing the buildup of energy we’ve got in Capricorn right now, and strikes me like a potential fight between mom and dad. Honor both emotional wishes and responsibilities and you’ll do best. Full moons are for releasing, so it’s a good time to set your intention to let go of emotional concerns or hurts that have outlived their usefulness. Also, we’re talking Cancer, so cooking yourself up some comfort food on New Years’ Day is a great plan. Spend extra time with family, loved ones or just loving yourself! If there is one thing Cancer energy has right, it’s loving. Hope the transition into 2018 finds you warm, safe and happy. May the year be jam-packed full of blessings for you. I am sure mine will be. And you know how I’m so sure? I’m going to seek those suckers out, hunt them down and appreciate the holy heck out of every single one of ’em!